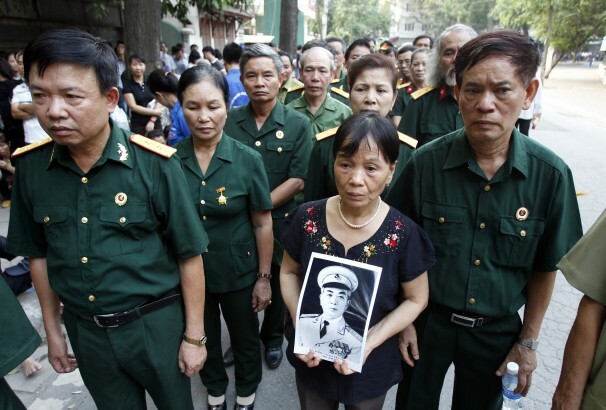 HANOI (Reuters) – Vietnamese poured into the capital on Sunday to bid farewell to Vo Nguyen Giap, the general who masterminded historic defeats of France and the United States to become one of the 20th century’s most important military commanders. Crowds lined the streets of Hanoi cheering, crying and holding aloft pictures of “Red Napoleon”, a national legend with a domestic standing second only to the leader of Vietnam’s struggle against colonialism, Ho Chi Minh. Giap died on October 4, age 102, after four years in a Hanoi military hospital. Short, slightly built and a man of no formal military training, Giap was ranked by historians among giants such as Montgomery, Rommel and MacArthur for victories over vastly better equipped armies that ushered in the end of foreign intervention and cemented communist rule in Vietnam. “He was the general of the people, always in the people’s hearts and in history,” said Nguyen Phu Trong, general secretary of the ruling party that Giap’s forces brought to power in 1975 after driving the United States out of what was then a democratic South Vietnam. “This is a big loss,” Trong said in a speech at his state funeral, broadcast live on national television. Hundreds of thousands thronged to catch a glimpse of Giap’s coffin as it was driven on a military vehicle past an unbroken line of mourners to an airport 30 km (18 miles) away. Giap’s body will be flown to his home province of Quang Binh for burial. The funeral has brought a show of unity that Vietnam’s current generation of leaders have struggled to foster in a country where three quarters of the 90 million population were born long after Giap’s battlefield victories. Though the Vietnam that Giap helped to liberate from Western control has seen unprecedented development and stability, discontent simmers over land ownership laws, entrenched graft and an economy growing at its slowest pace in 13 years. “I never heard guns or bombs but I know our history,” said Dao Huy Hoang a 21-year-old Hanoi student. Television and radio played somber music during the two-day funeral as people queued for hours to view the flag-draped coffin of the man they call the “big brother” of the nation. Giap’s critics spoke of his ruthless tactics and willingness to sustain heavy losses in pursuit of victory, his most notable, the humiliation of the French at Dien Bien Phu in 1954, which heralded the end of colonialism worldwide. His textbooks on guerrilla warfare inspired revolutionaries and insurgents the world over. He once said any army fighting for freedom “had the creative energy to achieve things its adversary can never expect or imagine”. In the decade leading to his death, Giap started to mellow. His post-war political role was short-lived and he was dropped by the all-powerful politburo in 1982 before taking roles as head of committees overseeing science and family planning. In a 2004 interview with Reuters, Giap recalled signing a book while on a trip to the United Nations in Geneva with the words “Vo Nguyen Giap, General of Peace”. In a moving speech, Giap’s eldest son, Vo Dien Bien said the motivation of his father and the troops who served under him was to build a peaceful, unified Vietnam. “In his death, his spirit will combine with the spirit of tens of millions of Vietnamese to become one harmonized power for a strong and wealthy Vietnam,” Bien said. Those who travelled to see Giap’s coffin expressed their thanks to him for winning independence. Among them was To Xuan Thanh, a 60-year-old dressed in his old army uniform, who rode a motorcycle for 200 km (125 miles) to Hanoi. “The general’s words and actions remain bright for all the veterans, not only in the war but in peace time,” he said. He is proof that even revisionists can sometimes be great people.